When you fancy a Chinese takeaway the lure of the ribs on the menu tends to be strong… well at least in my mind anyway. Try making your own so you can make them as sweet, savoury or as spicy as you want- or all three! A rack of pork ribs is inexpensive and an average sized rack feeds two people so it’s a bargain! Keep your eyes out for a rack that has plenty of meat on it as some can be a little scrawny and that only brings disappointment rather than pure porky joy! If you cast your eye down the list of ingredients you will notice that one of them is not Chinese, but Korean: gochujang. When I was putting the marinade together I thought what would give a deep chilli flavour but stand up to the other ingredients so it was settled. 1. 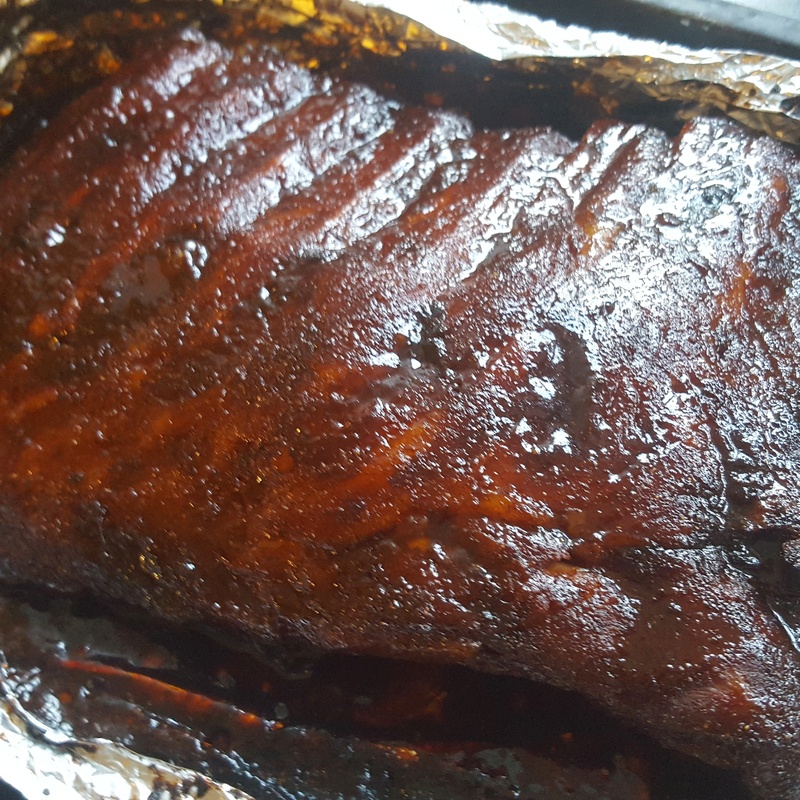 Ideally the ribs would have around 3 hours in the fridge marinating but overnight is perfect if you have a bit more time. Simply mix together all the ingredients in a bowl and pour most of the marinade over the racks. Cover and place in the fridge to marinate. 2. When you are ready to cook the ribs, preheat the oven to 160c/ 140 fan. Wrap the racks of ribs in foil parcels and make sure they are tightly sealed. Cook in the oven for around 3 hours (depending on the size of the racks). After this time the racks should be tender and flexible so you know they are nearly all set. 3. For the last step, turn up the oven to 200c/ 180 fan. Peel back the foil and brush the last of the marinade over the ribs and cook for a further 10- 15 minutes until sticky and unctuous. Use a knife to separate the ribs and grab a stack of napkins (you’ll need them! ); serve the ribs immediately. 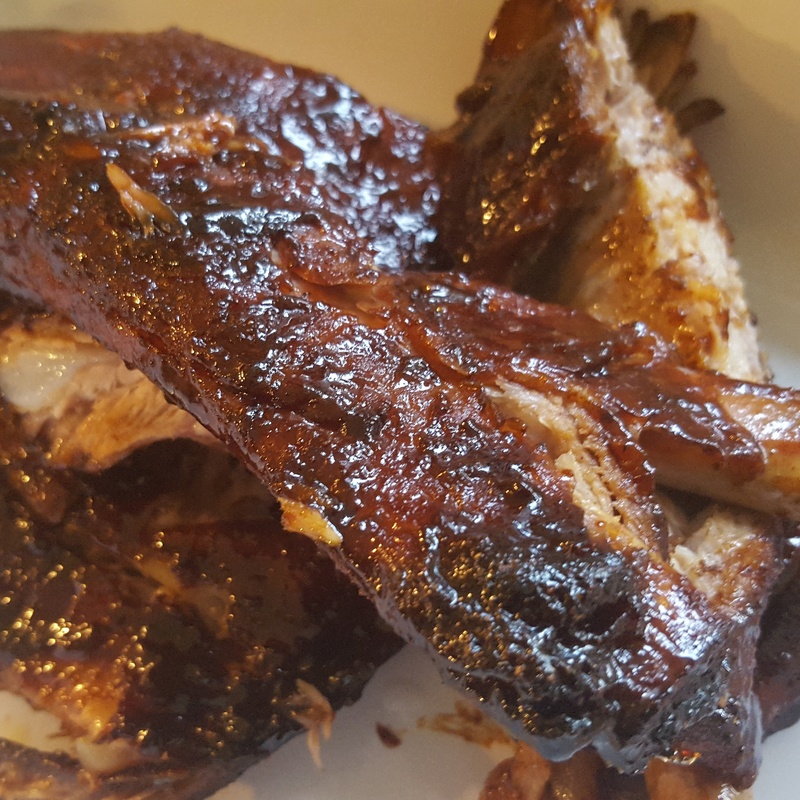 Chinese takeaway style ribs- let’s face it, there’s no elegant way to eat these but dive in!